The golf course at Victoria is certainly one of the very best in Australia. Only a single road separates Victoria from Royal Melbourne and the public course at Sandringham. Together they represent the largest contiguous belt of golfing land in metropolitan Melbourne. Victoria Golf Club has benefited from a dedicated programme of renewal and refurbishment. The elegant green and white pavilion that sits handsomely at the end of a tree-lined drive is a well-designed, comfortable facility much in demand with the club’s 2,000 members. Mike Clayton’s recent course enhancements have focused on the restoration of bunkers that had been grassed over and the regeneration of trees. Victoria’s golfing bloodlines run deep. It has won the Victoria Golf Association’s Division One pennant more than any club in the state. It is the home club of five times Open Champion Peter Thomson and British Amateur Champion Doug Bachli and the club has hosted the Australian Open three times. The front nine runs along the north and west extent of the property, while the back nine fills the central part and extends to the southern and easternmost limit of the land. Several of the holes are laid out in pairs alongside one another so the golfer is reversed. The club has twelve double bedrooms on the top tier of the clubhouse and welcomes visitors to stay. Some out of state golfers have been returning to the Victoria Golf Club for 30 years. Whereas devotees of the wonderful golfing lands of Melbourne’s Sandbelt will find all the themes at Victoria familiar, there is clearly something about the place that renders it even better than the sum of its very impressive parts. 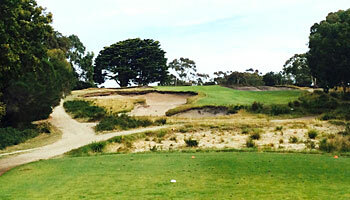 The above passage on the Victoria Golf Club is an extract from The Finest Golf Courses of Asia and Australasia by James Spence. Reproduced with kind permission. The Australian Masters was hosted at Victoria in 2010 and Tiger Woods headlined the event – defending the Masters title he won at Kingston Heath in 2009 – but the 2010 title went to Stuart Appleby, with Woods finishing fourth. Ian Poulter lifted the Australian Masters title in 2011, winning by three shots from Marcus Fraser. Separated from Royal Melbourne only by a road, Victoria naturally displays some of the same characteristics as its famous neighbour, although the land has less movement in part, and is not set on such a grand scale. The course is beautifully routed, getting the most out of the predominantly flatter terrain encountered in holes two through six with some gorgeous greens settings, and beautiful bunkering. The par 3's at Victoria are the strength of the course, each of them uphill and heavily bunkered, but there the resemblance ends. The fourth hole has a skinny plateau green which requires a straight hit. There are may top class holes at Victoria, but perhaps my favourite is the shorter par four, tenth hole with its dipping turning fairway and short iron approach to an elevated green. Great fun! With the greens firm and fast, and a hot north wind blowing, posting a decent score will require a steely nerve, clear decision-making, and a very tidy short game. Don’t miss any opportunity to play Victoria. The Victoria Golf Club is the home of the Great Peter Thomson, OAM. This beautiful course sits in the heart of the Melbourne Sandbelt. Simply amazing use of bunkers down here, extensive bunkering that provides great memorability and the reason we love the game is, as the 'Vic is, visually stunning and undulating couch fairways meet the golfer both off the tee and from pitching distance out. What a way to end playing 36 holes in a day, than by playing this beauty! The course was in great condition when I played and I also really enjoyed the ambience The Victoria GC gives off. While the back nine at Victoria Golf Club has possibly the greatest collection of holes in the Sandbelt, it is sometimes let down by conditioning, especially on the greens. Victoria was my favourite course on my last trip to the Sandbelt and I jumped at the opportunity to play it again. Some people knock it due to its back-to-back par five conclusion to each nine and the fact that three of the four par threes play uphill. Having played the course multiple times myself to establish my own independent perspective, you see something new every time. Admittedly, I did find that the 18th hole downwind is not an exciting or stimulating finishing hole. Furthermore, I continue to personally dislike the design of the greenside bunker on number 12, it’s very “un-Sandbelt like” and out of character with the rest of the bunkers on the property. Victoria is genuinely in the upper echelon on Australia's golf courses - clearly within most people's top 10 and really only behind RMW, KH and Barnbougle Dunes ( am yet to play Cape Wickham so I cant comment on that with authority). It's only weakness in my view is that all 4 par 3's are uphill with only the 4th giving a glimpse of the green from the tee. That and the rather unsightly dam which encroaches on the right of 17. Otherwise it is hard to fault Victoria. Tremendous fun, rewards good shot making, and a pretty decent walk over some of the best golfing land in the world. Fabulous. Do not miss this if you're in Melbourne. This is the best members course on the Melbourne sand belt, and considering the quality of the courses in that area, that is a big statement. Always in great condition, greens true and fast, great bunkering, a fairways wide enough for the average golfer, and rough that is true sand belt; sandy waste that is harder to hit from than any deep grassy lie.It also has the best collection of par 3 I have seen anywhere in the world - I really can separate the 4 of them, but if did, maybe the 8th, or the 16th, perhaps the 4th, ok, the 14h - plus imaginative short par fours that are just as easy to rack up a 6 as a 3. If you visit Melbourne, this is a must play, and you will enjoy it more than Royal Melbourne and Kingston Heath who are both rated higher but nowhere near as much fun. Victoria is perhaps my favourite Sandbelt course, just ahead of the Royal Melbourne West and Kingston Heath. It really deserves to be ranked a bit higher and is appreciably better than the Royal Melbourne East, which is far too high in these rankings, and Victoria is better than The Metropolitan in my opinion and is far more enjoyable for most handicap golfers than Moonah. Victoria’s bunkering is the best of the Sandbelt and while it may not be laid out on such a grand scale as Royal Melbourne its rolling topography is simply delightful, especially around the turn. Many people criticize Victoria for the back-to-back par fives that conclude both the outward and homeward nines. Granted, this is an unusual configuration but the 8th and the 18th represent genuine birdie opportunities and the 9th and 17th are pure three shotters for the vast majority of golfers. I simply love Victoria and would choose to be a member here over any other club in Australia.